Installing shower doors is a craft and a technique. ShowerMan has perfected our process over 40 years, to make sure that each and every project we work on achieves the same level of excellence our customers have to come expect. At ShowerMan, we offer more than simply the best products and most modern shower designs. We offer honest, dependable service. From the very first interaction, we work with you to design the perfect shower enclosure for you and your family. We know that each project, each bathroom, and each family we work with is a completely unique experience, and we will make sure that your new Frameless Shower Door meets your bathroom’s layout and your personal preferences. Our designers and installers have no room for error, measuring and installing our glass with zero to 1/8” tolerance. By being that precise, it means that there will never be any extra caulking. Why ruin your Frameless Shower Door by creating a frame of unsightly caulk when there is no reason for it? Caulk is simply there to provide a seal between the glass and the tile, nothing more, nothing less, and that’s all our team of expert installers use it for. 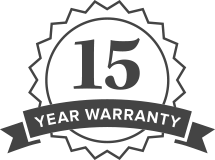 On top of our attention to detail, we stand behind each and every installation with our unprecedented 15 Year Warranty. As long as you follow our simple Maintenance instructions, your glass will sparkle for years to come. And, you can rest assured knowing that we have the confidence in our product and our installation to stand behind you and your shower door for the next 15 years. Shop around and see if any of our competitors have the confidence to stand behind their frameless shower doors for that long. Shopping for Frameless Shower Doors in Central New Jersey? Our Showroom is conveniently located on Route 9 North in Manalapan. Or, you can request a quote or call us at 732-303-9044 to schedule an appointment.